Roman Mstyslavych [Роман Мстиславич; Mstyslavyč] (Романко; Romanko), b after 1160, d 14 October 1205 in Zawichost, on the Vistula River in Poland. Rus’ prince; son of Mstyslav Iziaslavych and Agnieszka (daughter of the Polish prince Bolesław Krzywousty); father of Danylo Romanovych and Vasylko Romanovych. When his father died he was bequeathed the Volodymyr-Volynskyi principality (1170). After the death in 1199 of the last Halych prince, Volodymyr Yaroslavych of the Rostyslavych dynasty, Roman united Galicia and Volhynia and created the powerful Principality of Galicia-Volhynia. An able political and military leader, he brought the restive boyars to heel and cultivated the support of the burghers. He waged two successful campaigns against the Cumans, in 1201–2 and 1203–4, from which he returned with many rescued captives. 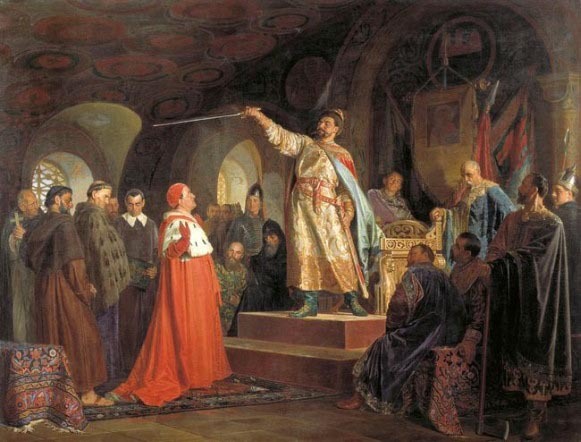 In 1204 he captured Kyiv and thus became the most powerful of all the Rus’ princes. He played an active role in the political affairs of neighboring states, such as Poland, Hungary, Byzantium, Lithuania, and Germany. Roman died in the Battle of Zawichost after he was ambushed by the Poles. He was described by a contemporary chronicler as a ‘grand prince, the sole ruler of all Rus’, who conquered the pagans and wisely adhered to the commandments of God.’ He founded the Romanovych dynasty (1199–1340). A referral to this page is found in 20 entries.